Reggae To Reggae - Live Music Thursday resumes featuring Mamadee | ComeSeeTv Broadcast Network ... Can you See me Now! 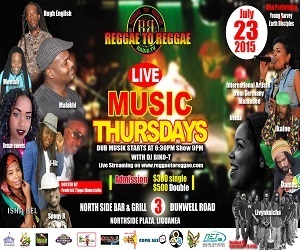 The Reggae To Reggae Live Music Thursday Show resumes celebrating the Earthstrong Anniversary of His Imperial Majesty Emperor Selassie on July 23, 2015. Already confirmed for the celebration are: "Trench Town Experience", "Damas", Keida and international recording artiste who now hails from Germany, "Mamadee".